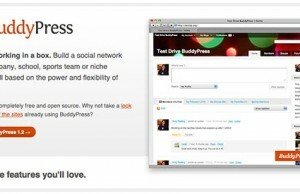 WordPress 3.0 stable version is released and it is having WordPress Single Site and MU merge options. We covered pictorial guide for enabling MU options on WordPress 3.0 for new users. So now onwards, there will not be a separate package for WordPress MU and WordPress single site. If you are having WordPress MU setup for your multiple site network, now you can upgrade to WordPress 3.0. There is no need for complicated migrations as WordPress has developed the code in 3.0 in such a manner that your existing setup will remain as it is after upgrade. So there will be simple update rather than any migration. If your websites are currently running on WordPress MU then go ahead and click on the “Upgrade to WordPress 3.0 MU” link on the admin dashboard to upgrade your setup to the latest version i.e. WordPress 3.0. It doesn’t matter that you are running WordPress single site or MU, a simple update will run and that will complete the upgrade to 3.0 within a minute. 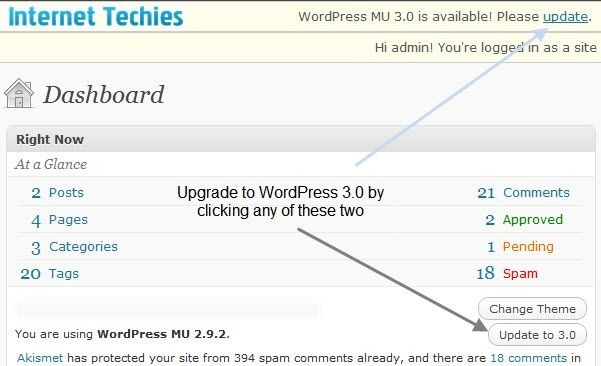 In case your hosting account doesn’t support auto upgrade, you can upgrade your MU setup to WordPress 3.0 manually by replacing the files with WordPress 3.0 files thru FTP clients. That will also run an update after opening the URL for the first time after upgrade and will update your setup, database structure etc. to 3.0. Once your site dashboard upgrade completes, you can check your plugins and other stuff related to your WordPress setup. It is confirmed that Domain Mapping also works fine with WordPress 3.0 so in case you are running domain mapping on your setup, don’t worry that will work fine.